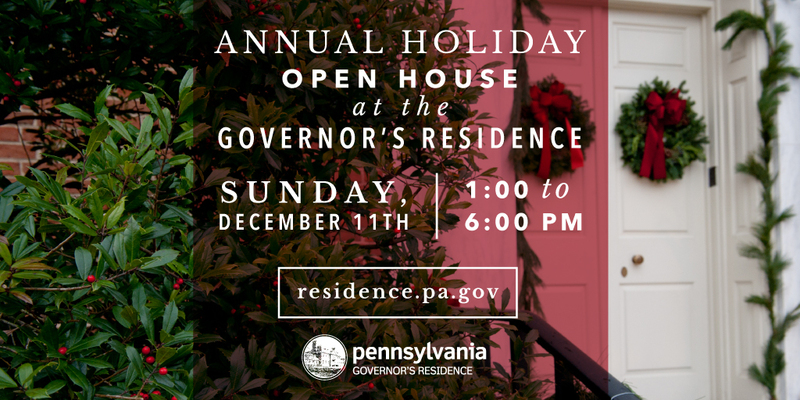 Harrisburg, PA – Governor Tom Wolf and First Lady Frances Wolf invite the public to join them this Sunday, December 11th for a Holiday Open House at the Governor’s Residence, located at 2035 North Front Street. The Open House, which will run from 1:00 p.m. to 6:00 p.m., will be held in conjunction with the Historic Harrisburg Association’s Annual Candlelight House Tour. During the Open House, visitors will have the opportunity to drop off a new, unwrapped toy in the Toys for Tots box. A marine will be present to collect donations and talk about the program. Representatives from the American Red Cross Holiday Mail for Heroes program will also be present with holiday cards for visitors to fill out for local veterans. Staff from the Governor’s Residence, who decorated the Grand Hall Entrance. Visitors will also have the opportunity to view the current art exhibitions on display at the Governor’s Residence, including works by the late Pennsylvania House Speaker K. Leroy Irvis, a photography exhibit curated by the Historic Harrisburg Association highlighting the history of Pennsylvania Governors’ Residences, as well as “thread paintings” by Easton-based artist Emil Lukas. For those unable to attend the open house this Sunday, the Governor’s Residence will be open from 12 p.m. to 2 p.m. on December 5th, 6th, 7th, 12th, 13th, and 14th for holiday tours. Both the Holiday Open House and tours are free, and reservations are not required. No large bags, purses or totes are permitted, and security measures will be in place. For more information, visit www.residence.pa.gov.